Legends state that if you happen to be lucky enough to touch a unicorn's magical horn, you'll be blessed with good luck for the rest of your days. You probably want to go out on a unicorn search right now, but you should know that the beautiful mystical creatures are scarce and nearly impossible to find. Instead, we urge you to go purchase this gold unicorn horn that just may bring you a tremendous amount of luck as well! 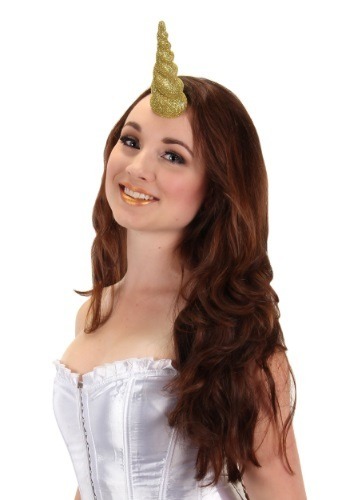 Wear this gold unicorn horn and you'll feel very blessed because everyone will shower you with lots of empowering compliments. Wear it with a unicorn costume for a maximum amount of attention or just wear it by itself to make a rather bold fashion statement. This fairy tale inspired accessory is a gold glittery horn fastened to a clear strap so all that everyone will see is your beautiful horn and not the elastic attachment. Once this horn is placed on your head, you'll start feeling like one lucky lady, just you wait and see!